Amitayus is one of the longevity Buddhas, and this is clearly seen in the translation of his Sanskrit name: amita = infinity, and ayus = existence, life. 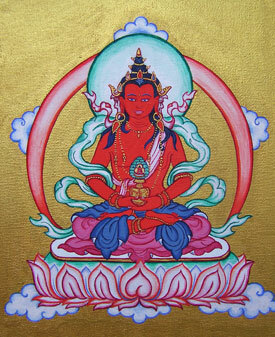 He is red in color, the color of sunset (which could symbolize the attainment of nirvana). Hid hands are in his lap in meditation mudra holding a golden vase containing the nectar of Long Life, in which a wish-fulfilling tree grows. Amitayus is a manifestation of Buddha Amitabha, one of heads of the Five Buddha Families. He is often depicted together with White Tara and Namgyelma (Ushnisha Vijaya), and the three of them form the set of 3 Longevity Buddhas.